See all Blog Posts here..
I’d like to host a foraging walk in Glenealy Wicklow up Carraig Mountain on Saturday 28 May. This will take place from 1-3pm and costs €20 per person. We’ll hike up Carraig Mountain and during this walk we will identify up to 30-40 wild Irish plants that are medicinal or edible. I’ll discuss some of the uses and properties of these plants. Please bring a notebook, a basket and dress for the weather. Comfortable footwear a must! Bring a small picnic if you’d like. Spaces are limited, so book your place here. place to attend a workshop. (“if I’ve brought it”). But no water. sauerkraut, she told us, is “cooked” in its own juice. the ‘good’ bacteria – this is the beauty of preserving through fermentation. anecdotes through the recipes kept us listening. You can also add juniper berries. as a barrier to keep the culture you want in the jar, and what you don’t want out of it. the surface, above the liquid, where they’ll be exposed to moulds you didn’t invite. content will alter with time, and that will in turn alter the flavour. category- would be able to drink kefir than pasteurized cow’s milk. goats herself and she enthused on their affectionate natures (“they’re just like dogs! milking which, she assures us, is excellent for her glutes!). to mind. Fair trade is best! yeasts from the air can then get through. Pickles were discussed. Cider apple vinegar. The air sharpened with memories. topic like the cultures themselves – a moment of attention here, a tweak there. Culture, like conversation, needs nurturing until it gets active. it in an airtight bottle and if needed, add another spoonful or two of sugar. are the free ebooks that you can download on signing up to their mailing list. Takes place in a native forest in Glenealy, Wicklow about 40 minutes south of Dublin, 10 minutes from Wicklow Town. Run by Angie Kinsella and Courtney Tyler this event will take place in a beautiful natural forest woodland setting. The morning will start off with coffees and tea and a quick introduction followed by a walk in the woods identifying some wild and medicinal plants, trees or herbs that can also be used as a food. A very special meal will have been prepared in advance by Angie and Courtney that will feature some local, seasonal, healthy foods and fermented drinks. Followed by a fermentation workshop where we will teach you how to brew your own homebrews such as a naturally fermented ginger ale and go on to cover other ferments as time allows. There will be samples to taste. Please bring some comfortable walking shoes and wellies if needed. Warm and dry clothes to cater for Irish weather. Bring a notebook if you’d like to take notes. The event will take place rain or shine! If you have any food requirements allergies or intolerances, please let us know? We will do our best to cater to your needs. Payment in full of €85 per person by the 1st April by PayPal or bank transfer. We offer a deal price of €150 per couple. Early bird price of €75 each if paid in full before 1st April. Children under 12 are free. More exact details will follow closer to the date. Thanks! Looking forward to seeing you there! 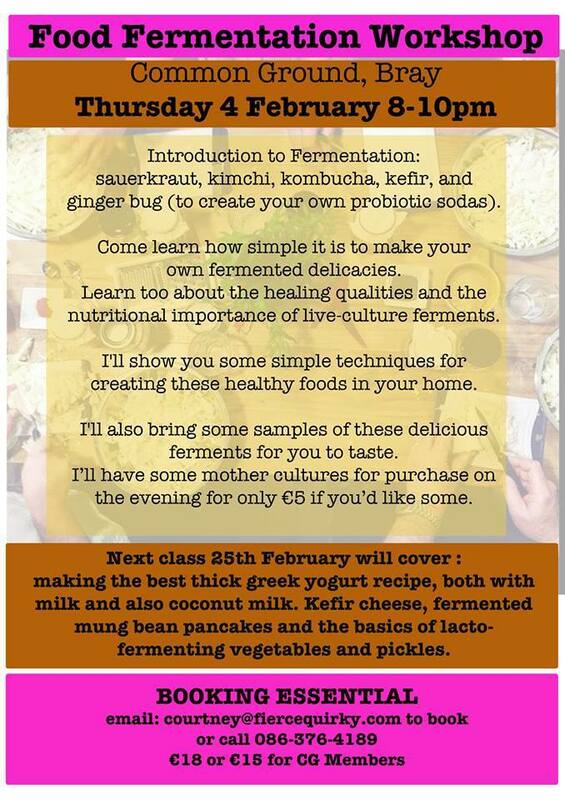 The next level fermentation workshop will take place on the last Thursday of this month in Common Ground in Bray. Again it will run from 8-10pm. 25th February 2016. Don’t forget to add it to your calendar! 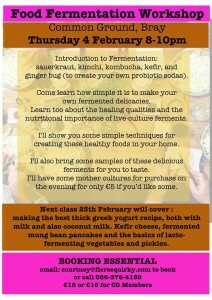 Come learn how simple it is to make your own fermented delicacies. Learn too about the healing qualities and nutritional importance of live-culture ferments. In this workshop we will cover different ferments than we did at the last event. We will learn how to make a gorgeous greek goats milk yogurt, how to make co-yo (coconut yogurt) 2 different ways, kefir cheese, fermented mung bean pancakes and also go over the basics of facto-fermenting vegetables and pickles. I will bring some samples of these delicious products for you to taste on the night. I will also have some mother cultures for purchase on the night for only €5 if you’d like- such as kombucha and kefir. Google maps for finding your way to Common Ground can be found below. The address: Beverly Studios, Church Terrace, Bray, Co. Wicklow, Ireland. Booking is essential- book here to pay in full. The cost is €18 for the evening or the discount of €15 for current Common Ground members. Contact Courtney at: courtney@fiercequirky.com or call 086-376-4189. Click here to pay the deposit to book your place. Hope to see you there! The importance of live culture ferments, as a food, to increase the bio availability of vitamins and minerals, and to preserve food. and Ginger bug to create your own easy healthy traditionally fermented probiotic sodas such as ginger ale. The next one will take place in the same venue on the 25th February. See the attached poster for all that we will cover. Booking essential to secure your place.